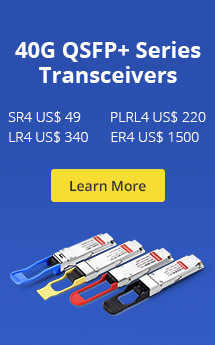 Recent interest has been shown in further increasing the transceiver port density for optical datacom applications, particularly blade servers, as well as finding a cost effective way to increase aggregate data rates beyond 10 Gbps. One approach is the Quad Small Form Factor Pluggable (QSFP, or QSFP+) Multi-Source Agreement (MSA), originally announced in March 2006 and finalized in December 2006 following a period of public comment on the proposed specifications. The QSFP MSA is currently endorsed by over 20 companies (e.g, Fiberstore). 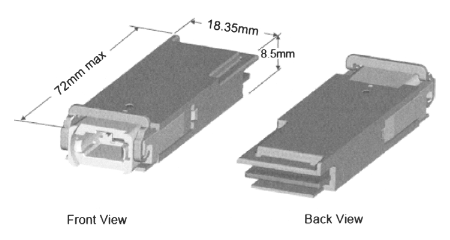 As illustrated in the figure below, QSFP defines an integrated, hot pluggable, 4-channel optical transceiver, designed to replace four standard SFP+ modules in a space only 30% larger than a single SFP+. The resulting port density is three times higher than conventional SFP+ designs; various stacked and ganged configurations are possible to achieve increased port density, and presumably lower cost per port (a minimum of 21 mm center-to-center spacing is allowed for adjacent QSFP+ Transceiver). The transceiver is a so-called z-axis pluggable module, meaning that the 38 contact electrical connector can be inserted parallel to the host circuit board without requiring additional operations such as screwing the transceiver package to the host card. 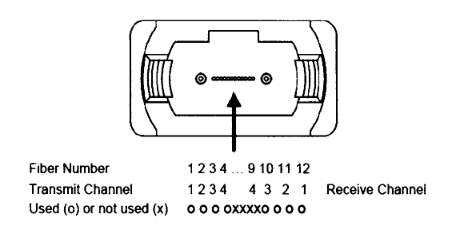 QSFP accommodates a standard MPO connector, though as shown in figure above only 8 of the 12 available fibers are used to carry signals. Exposed portions of the optical connector or card bezel are color coded following common industry practice (beige for 850nm/multimode, blue for 1300nm/single-mode, white for 1550nm/single-mode). The MSA defines a mechanical form factor with latching mechanism similar to that used by XFI, host board electrical receptacle, and a cage to house the transceiver when it is plugged onto a host card. Digital diagnostics are provided to monitor link performance; the diagnostic interface includes the ability to set link distance parameters that identify the capabilities of the transceiver, including an option for copper QSFP implementations. QSFP uses a single 3.3 V nominal power supply, with a maximum power dissipation under 3.5 W.
Various types of vendor-specific heat sinks can be attached or clipped onto the transceiver. 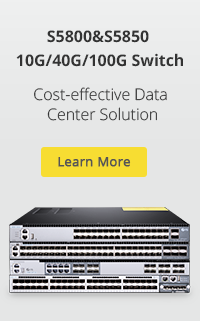 Data rate options ranging from 100 Mbps to 10 Gbps per channel are defined (with an available rate select pin on the electrical interface) to support protocols, including Ethernet, Fibre Channel, InfiniBand, and SONET/SDH. In particular, with a potential data rate of 10-Gbps annel, this transceiver may provide a cost-effective implementation of 40 Gbps links. The inherent 4 + 4 channel architecture of QSFP lends itself to increase distances supported by multilane serial I/O electrical interconnects such as PCI Express (PCIe) and InfiniBand. This entry was posted in 40G QSFP+, Fiber Optic Transceivers and tagged 40G Ethernet, QSFP Transceiver, QSFP+. Bookmark the permalink.